Garlic Butter Biscuits - delicious with everything from pasta to steak dinners! Garlic Butter Biscuits. Perfect with everything from hearty chili or fried chicken to indulgent steak dinners. They make the base of excellent breakfast sandwiches too! Garlic Butter Biscuits are just the thing your garlic loving soul has been waiting for. I am a completely unrepentant fan of garlic and have been for many, many years. I’d be surprised if there was another home in the city that uses as much as we do here. I think my love stems back to my particular dislike of yellow onions, which are traditionally used in cooking in practically everything in this province. I never liked them growing up and I still don’t buy them. I find the flavour far too sharp, strong and unappealing. While almost every other onion imaginable can be found at different times in my kitchen, the yellow onion still remains banished. I think when I was younger and first began cooking, I really took to the idea of combining sweet onions with fresh garlic as a replacement for those ever present yellow onions. None of my siblings or parents seemed to notice that yellow onions had disappeared in the many meals I cooked growing up. It was a happy compromise that kept me cooking, and kept them all eating! Today, I love garlic more than ever. The scent as it hits heated olive oil in a sauté pan is one of my favourite kitchen smells. The robust flavour of whole, sweet sticky roasted heads of garlic to be enjoyed with our family favourite English Style Roasted Potatoes and a dollop of sour cream is truly one of my top ten favourite things to eat…maybe even top three. I can’t live without it. Even as I type this Garlic Butter Biscuits recipe post, there is a small turkey roasting in the oven downstairs and a pan of potatoes, roasting with garlic, sits right beside it. I’m even tempted to go make another batch of these biscuits to serve with it…..or maybe I’ll use them to make leftover hot turkey sandwiches tomorrow with reheated turkey and smothered in gravy. I’m drooling already! If you like the garlic butter used in this recipe you’ll also find it in this Family Style Garlic Butter Steak. 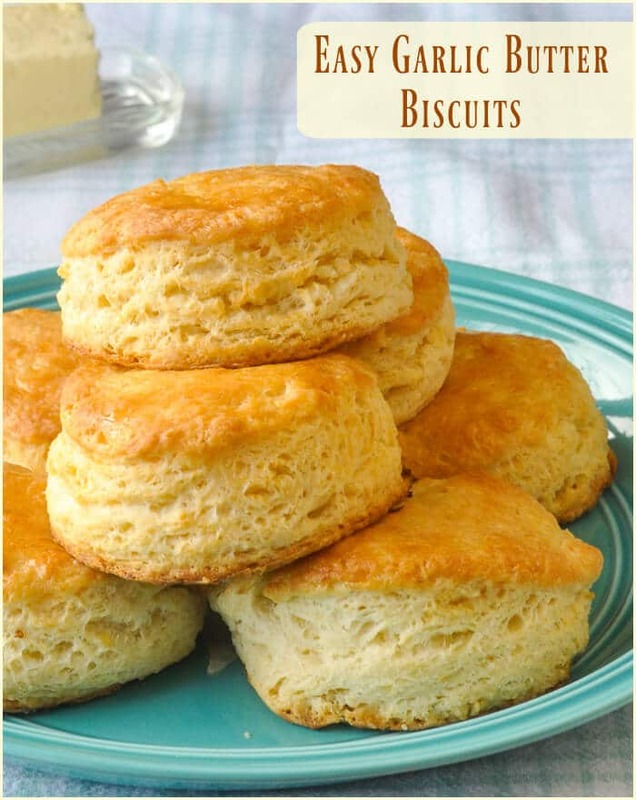 Like this Garlic Butter Biscuits recipe? You’ll find lots of other great ideas in our Bread & Baking Category and in our Side Dishes Category. To keep up with the latest home style cooking & baking ideas from Rock Recipes plus daily recipe suggestions from decadent desserts to quick delicious weekday meals, be sure to follow Rock Recipes Facebook Page and follow us on Instagram. Garlic Butter Biscuits - perfect with everything from hearty chili and fried chicken to indulgent steak dinners. They make the base of excellent breakfast sandwiches too! First prepare the garlic butter, which you will want to do an hour or more in advance. Even the day before is perfectly fine. This garlic butter will easily keep for a week in the fridge. Heat 3 tbsp of the butter over low heat; you will not want the butter to brown at all. Add the garlic and sauté it in the butter for just a minute or so until it softens. Remove from heat and allow to cool almost to room temperature. Stir it into the remainder of the 1/2 cup of soft butter at room temperature until thoroughly combined. Spoon the garlic butter onto a piece if plastic wrap and wrap it loosely before gently forming it into a small log shape. Refrigerate the butter until firm, then chop into small pieces about the size of the top of your thumb. In a food processor, blend together the flour and baking powder. Pulse in the cold garlic butter pieces. Do not over incorporate the butter into the flour. Similar to making a flaky pastry, small pieces of butter should be visible in the flour. Transfer this mixture from the food processor into a large mixing bowl and make a well in the center. Pour in the buttermilk. Working very quickly with a wooden spoon, fold the dry mixture through the buttermilk, only until the flour disappears, then stop immediately. Drop the sticky dough onto a well floured counter top or bread board. Sprinkle the top of the dough with additional flour as well as flouring your hands to handle the dough. I don’t even use a rolling pin for these biscuits, the dough is soft enough to pat it out gently with floured hands to a thickness of about 1 & ½ inches. Using a sharp 3 inch biscuit cutter cut the biscuits out an place them on a parchment paper lined baking sheet. 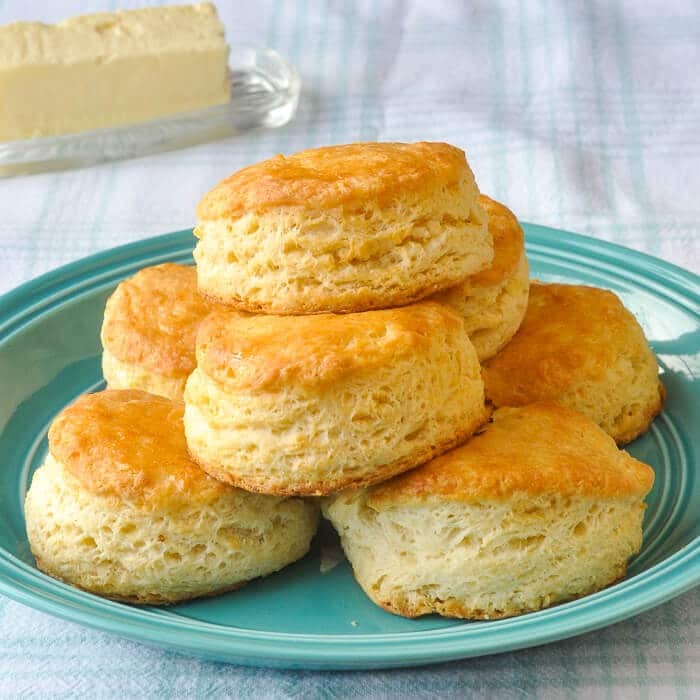 I recommend aluminum baking sheets because they tolerate the higher oven temperature without burning the bottom of the biscuits. 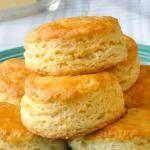 Bake in the preheated oven for about 20 minutes or until the tops of the biscuits are evenly golden brown. As a substitute for buttermilk, just stir a tbsp of plain vinegar or lemon juice into regular milk to sour it. Rock Recipes a participant in the Amazon Services LLC Associates Program, an affiliate advertising program designed to provide a means for us to earn fees by linking to Amazon.com and affiliated sites. Our product recommendations are almost exclusively for those we currently use or have used in the past. Made a batch of these to go with a roast pork and they were delicious. I used Ener-G sodium free baking powder because of kidney issues and need to reduce my sodium intake. It does require twice the amount to work. Sure. I’d still use it.